The focus is on darkness moving to light. Paths to new wisdom and humor. This book is not a fishing book. It is a book of stories and photographs. Go ahead, mark it up – make it your own. Share it with the people you love. We write to see what we have to say. We take photographs to see what is there. In that frame, that life. Paul and I met years ago and loved each other’s work, each other’s way of putting things. We had long, aimless going-nowhere-exactly conversations with the discipline of listening and wondering, not interrupting, not already "knowing." These meandering conversations showed us not only what we had to say, but left room for original ideas to bubble up and surprise both of us. It started with a playful debate about the things we love in our lives and whether this life really is a privilege. 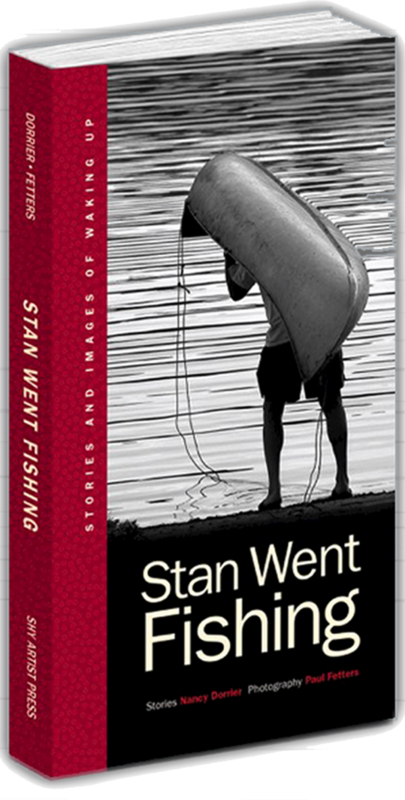 The stories in Stan Went Fishing grew from our Saturday morning group calls — the two of us plus Doug McVadon and Jane Smith reading to each other our writings from the week, ordinary things and miracles too. We write Natalie Goldberg-style, going from our first thoughts, keeping our hand moving, getting it on paper. Many Saturdays ago Paul suggested, "Let’s make a book of your stories, paired with my photographs." Each story stands alone, and in an illuminating way each photograph goes with its paired story. You can see the connection when you look, some combinations more obvious than others. Mary Beth worked with us to edit each story to refine its point while retaining its meaning. Round after round. The three of us gathered at Smith Mountain Lake in Virginia last year to work on the stories and select the photographs. Several hours in, with a sea of papers, and photos surrounding us, Nancy teared up and asked Mary Beth, "Is this any good? Should we just stop?" Mary Beth welled up and replied, "It’s wonderful, that’s why we’re editing!" For years, we have continued our conversations of amazement, laughter, and appreciation about the simple things in our lives. Discussing the funny, sad, and sweet people and events that show up in our stories and photographs. Mary Beth all the while has provided us with love, encouragement and her ruthless clarity of eye and ear helping us translate the stories for others. This book is a means of bringing our conversations to you. The stories and photos are about life, and even though they come from a specific life, you can read them and find yourself in each. We are also developing a series of lessons and workshops that bring clarity and peace of mind to the participants. We’ll offer coaching in writing and photography, focusing on building your ability to work from and trust your first impulse. Together we’ll dive in to create and discover. You’ll be left with gratitude for past mentors and clarity for the road ahead.